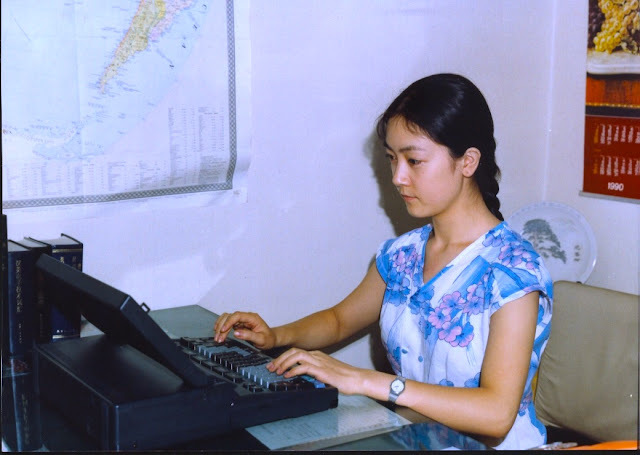 This photo was taken when I worked as an intern at a company in Beijing during a summer vocation when I was a graduate student. See the old-fashioned computer in early 1990''''''''s? I learned how to type Chinese character with a professional input method while working there. With this method, I can type super fast. And prior to that, I had taken an English typewriting course, in which I learned how to type English properly and quickly on a real typewriter like a typist in the old days. I remember the minimum requirement was to be able to hit the keys for 250 times, or to type 60 words per minutes, without looking at the keyboard, or your finished job, or the screen. I did graduate with such a speed. At that time I didn''''''''t know why I had decided to learn such a skill. When I was in university, I "blindly" took many courses in many different areas and learned many different things. But years later, when I ended up being imprisoned in a labour camp and subjected to all kinds of torture for practicing Falun Gong, and after I decided to write a book to expose the unprecedented persecution(please refer to my article From A Prisoner To A Writer ), the ability to type very fast in both English and Chinese became very important. For me, the time spent on learning how to type both English and Chinese in a professional way is perhaps one of the best "investments" I have ever made. It is hard to estimate how much time I have saved in all these years, because I have been writing a lot on computers ever since I started writing my book Witnessing History: one woman''''''''s fight for freedom and Falun Gong in 2001.